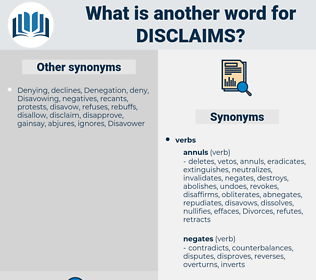 What is another word for disclaims? 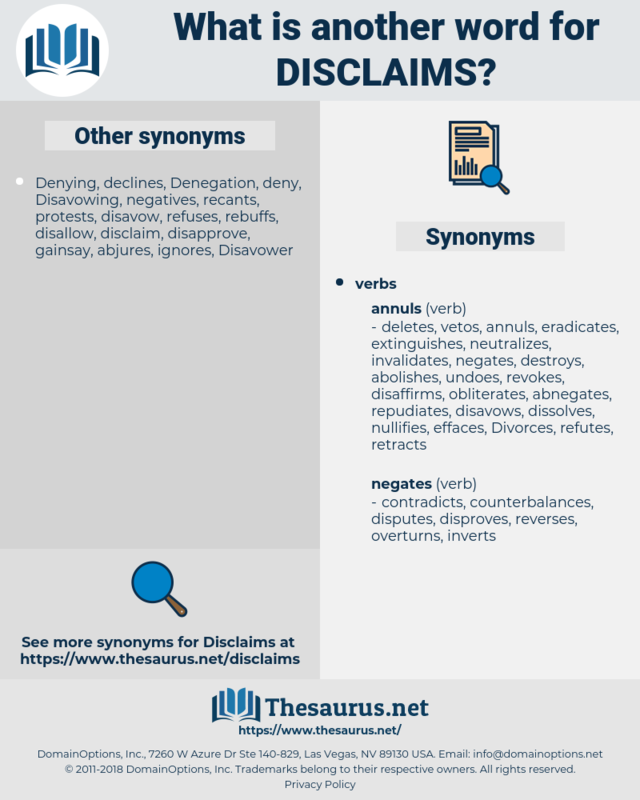 disallows, dismiss, dismisses, discards, disregards, disagrees, repudiates, relinquishes, rescinds, waives, assumes, rebuts, refutes, refuses, Denies, fails, deplores, forfeits, declines, abandons, foregoes, surrender, surrenders, renounces, accepts, denounces, shuns, forgoes, contests, shoulders, ejects, opposes, emits, undertakes, Bears, pushes, quits, Kicks, Gives, throws. The Superintendent disclaims all authority, and refers me to you. I will now read to your Lordships an extract from that stuff, called a defence, which he has either written himself or somebody else has written for him, and which he owns or disclaims, just as he pleases, when, under the slow tortures of a Parliamentary impeachment, he discovered at length from whom he got this last bribe. decline, Dutch Elm, declaim, doxycycline.